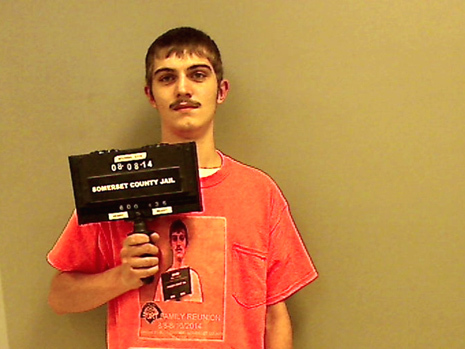 In a marvelously meta moment, a 19-year-old last week posed for a jail booking photo while wearing a t-shirt with a reproduction of the mug shot taken of him after a June arrest for drunk driving. Robert Burt was busted for operating under the influence and driving without a license. 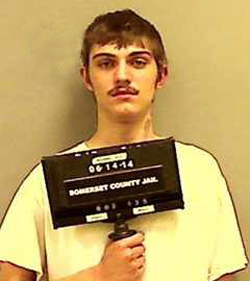 Burt, a resident of the central Maine town of Pittsfield, posed for a June 14 booking photo (seen below) at the Somerset County Jail. He was wearing a white t-shirt and held a slate in his right hand. Burt, who happily wore the orange shirt for his jail photo, subsequently wrote on Facebook that corrections officers made him hold the slate in a way “so you could see the shirt.” He added, “They laughed there asses off haha.” The shirt’s mention of a family reunion is an apparent reference to an incarcerated Burt relative. Following his 48 hours in the clink, Burt emerged from the Somerset County lockup last Sunday evening and went to Facebook to share the good news with friends. “I’m out bitchs,” he wrote. Two days later, he delivered a glowing review of his jail photo. “Probably the best mug shot ever haha,” Burt decreed.